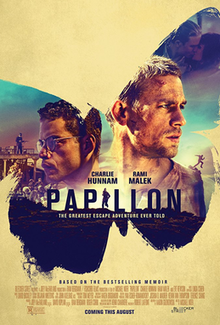 I just watched a newly released movie Papillon and fully enjoyed it. I kept an open mind watching it, knowing ahead of time this was another remake. This movie is based on a true story. The actors were perfectly cast for their roles, Henri Charriere Papillon and Louis Dega, his friend. The characters masterfully portrayed the human emotions of men facing betrayal at every turn, trying to endure cruelty and violence, and having a will to live despite such brutal conditions. I did feel the movie was a bit too long in length but would recommend it. Doug is currently reading The Fallen by David Baldacci.